Al Boughton has been an industry leader for over 45 years. His current capacity as Co-Founder of Trailcon Leasing began more than twenty-six years ago when he decided to leave his role of President at Provincial Trailer Rentals to branch out on his own. The rest, as they say, is history as Trailcon has enjoyed tremendous success, celebrating its 25th anniversary in 2017, and grown its fleet to over 8,500 trailers while becoming a well-respected supplier of lease and rental units. Al has been extensively involved with various industry organizations and other local business organizations throughout his career. He has been involved with the Ontario Trucking Association for more than 40 years in various capacities including chairman, vice-chairman, board member and on the executive committee. He was also involved with the Transportation Committee and the Airport Committee for the Mississauga Board of Trade for more than 15 years. Additional industry associations include being a founding member of the Private Motor Truck Council, and a long-standing member of the Toronto Trucking Association. 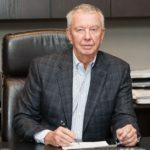 He continues to be actively involved in the Toronto Transportation Club, the Canadian Trucking Alliance and the Intermodal Association of North America. In November 2012, Al was awarded the prestigious Shaw Tracking – OTA Service to the Industry Award, representing the highest honour that can be bestowed upon a member of the trucking industry and this was also the first time the award was presented to an Allied Trades member of the OTA.